Pro poker player Gordon Vayo has voluntarily dismissed his lawsuit against PokerStars corporate entity Rational Entertainment Enterprises Limited (REEL) in the wake of PokerStars’ discovery that bank and utility statements submitted earlier to the company by Vayo were almost certainly forged and fraudulent. The voluntary dropping of the action by Vayo was accompanied by the withdrawal of his original lawyer, Gregory A. Fayer. Fayer withdraw as Vayo’s counsel shortly after PokerStars notified Fayer regarding the document forgeries. Vayo has since retained a replacement attorney, William A. Bowen, though this may be a defensive move, given the possibility of civil or even criminal sanctions against Vayo, who prior to this was most well known as the runner-up in the 2016 WSOP Main Event. 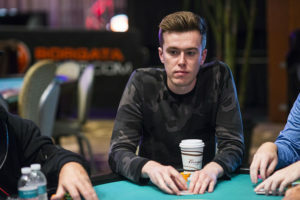 Vayo sued REEL in May of 2018 after PokerStars froze his account within weeks of Vayo’s winning of over $692,000 in a large prelim event in Stars’ 2017 Spring Championship of Online Poker (SCOOP). Noting that most major sites review the accounts of major winners, a general review of Vayo’s account turned up evidence that Vayo, a California resident, had played the SCOOP event and other events on PokerStars from the US, using a VPN (virtual private network) to make it appear that he as in fact playing from Canada. PokerStars repeatedly asked Vayo beginning in July 2017 to provide proof of his presence during the event in question, which took place largely on May 21-22, 2017. Eventually, Vayo submitted bank and utility statements purporting to show his presence in Ottawa during the event in question. PokerStars originally accepted those submissions at face value, before later learning from an unnamed person with knowledge of the situation that each of the documents submitted had been altered in significant ways, and in the case of the bank statements, leaving numerous mathematical errors from unmatched transactions. PokerStars has not identified the tipster nor the alleged forger in any of the court documents filed openly to date. Vayo had originally sought $690,000 plus trebled and other damages from PokerStars. Stars, when it contacted Fayer about the forgeries, offered to drop the matter without seeking compensation for damages and legal expenses if Vayo dropped the case with prejudice, meaning he would not be allowed to refile it. Instead, Fayer (on behalf of Vayo) simply dropped the case, perhaps in the knowledge Vayo was obtaining replacement counsel. However, according to the REEL filing, Vayo’s new lawyer did not respond meaningfully to at least four REEL inquiries regarding the forgeries. This led REEL to file its open motion for damages and expenses, for nearly $300,000 so far and likely more, as the prevailing party following Vayo’s dropping of the case. PokerStars remains in possession of roughly $690,000 frozen in Vayo’s account. In situations involving underage or prohibited-jurisdiction play, in which the illicit play does not target specific other players as a form of cheating, Stars’ longstanding policy has been to devote the funds to charity.